This pizza dough is oil free. A healthy whole wheat, Oats and Bran crust that comes out soft and chewy on the inside and crisp on the outside. In oil free version I used milk instead of oil in the dough and for brushing which helped for the soft dough and golden crust. I topped it with onion, bell peppers , tofu with sundried pesto however feel free to try out with your favourite toppings and sauce. Multigrain foods will be high in complex carbohydrates and protein. Complex carbs are great for energy production, and this can help with exercise and losing weight. In addition, they will contain nutrients, fiber and essential minerals like magnesium, copper and iron. Multigrains that contain whole grains will be filled with essential fatty acids, B-vitamins, starch and fiber. Place honey, salt, hot water in a bowl mix well -sprinkle yeast and allow it to rest for 10-15minutes/until frothy. In a large mixing bowl combine wheat flour, powdered oats, bran flakes mix well and add in the frothy yeast mixture and start mixing and then add warm milk little at a time until comes together. Bring the dough onto the floured surface and knead gradually by sprinkling some milk/water if its dry/ dry flour when sticky alternatively and knead for 5-7minutes. Then transfer the dough into a bowl (grease the bowl with oil if desired) cover with kitchen towel and let it rise in a warm place for about 35minutes or until doubled in size. Pre-heat the oven at 220deg C.
When the dough is risen, punch it down shape into a ball . place the dough for pizza onto the parchment lined baking sheet and spread it out using wet hands until about 1/4inch thick. Brush some milk on the base , spread pesto, onion, bell pepper , tofu sprinkle herbs and bake it for 12-15minutes/until golden brown and little crispy. For pizza with oil is used the same dough and toppings but brushed the base with oil and drizzled some oil on but I didn’t find any much difference however veggies and taste can be personalised as per the taste. Water and milk consistency may vary a bit depending on the flour. In oil free pizza the crust turned out crispy and soft in the centre but make sure to use milk in the dough and for brushing to retain the golden crust and soft texture. Posted on September 20, 2014, in International, Main Course and tagged Chitras healthy kitchen, drchdietfood, Italian recipes. Bookmark the permalink. 38 Comments. 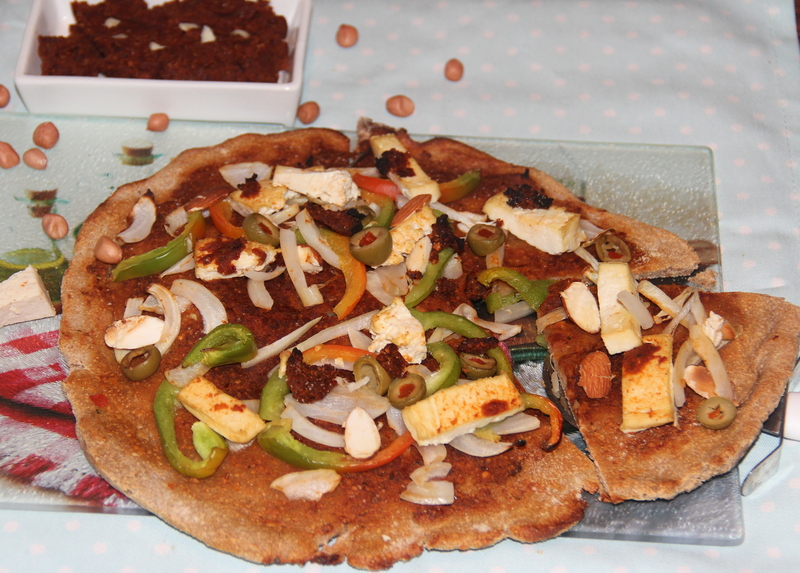 Great pizza and with the sun dried tomato peanut sauce, delicious and so healthy. Sun-dried pesto-to spread.. Nice touch!!! I love making multigrain dough for our pizza! This one looks great!! Thanks Skd for your kind appreciation.. This sounds really good.Going to try out . This sounds so good. I love healthy versions of many peoples comfort foods. Pizza is definitively the one for me!